There is an old saying that the victors get to write the history. This could not be more true than with respect to Vietnam. 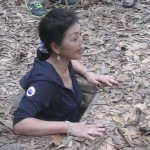 This was my first time visiting Vietnam since the war. From November 1969 to November 1971, I was a pilot on C-130’s for the U.S. Air Force in support of our efforts. At that time, I saw most of Vietnam, from the Mekong Delta to the DMZ, but only from the air and from the runways at the air bases. This was a chance to actually see the country up close and personal. 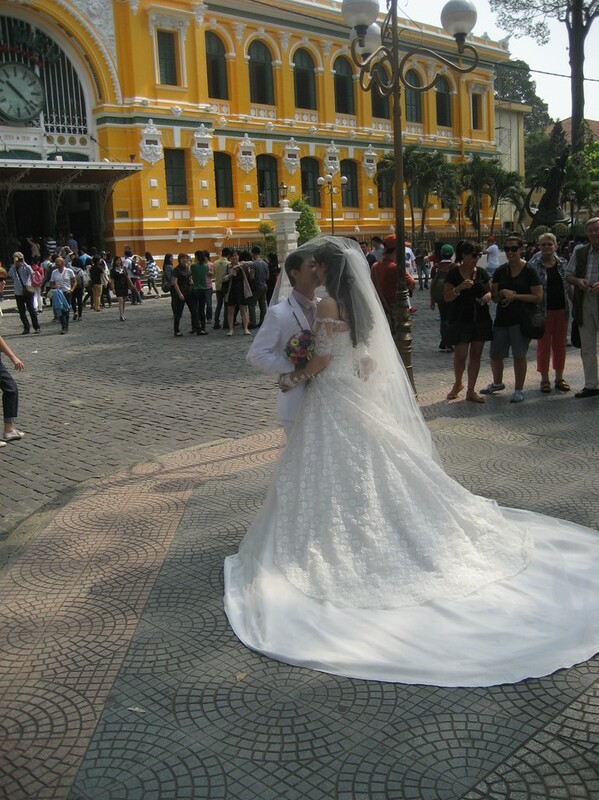 We landed at Ho Chi Minh City (Saigon) in the South then flew to Danang. 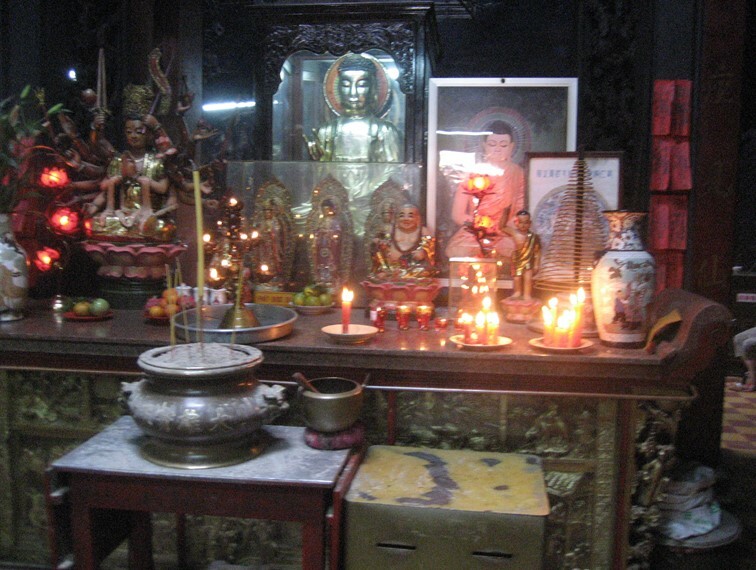 From Danang we bused to Hoi An then to Hue. 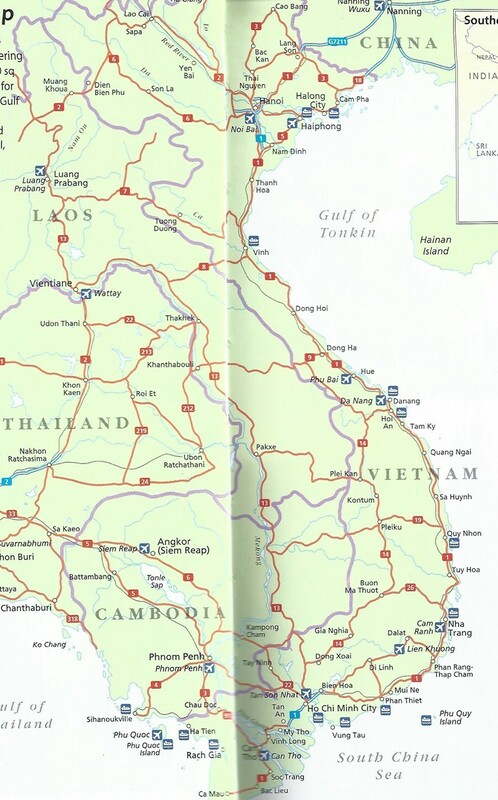 From Hue we flew to Hanoi then bused to Ha Long Bay (not shown) and back. 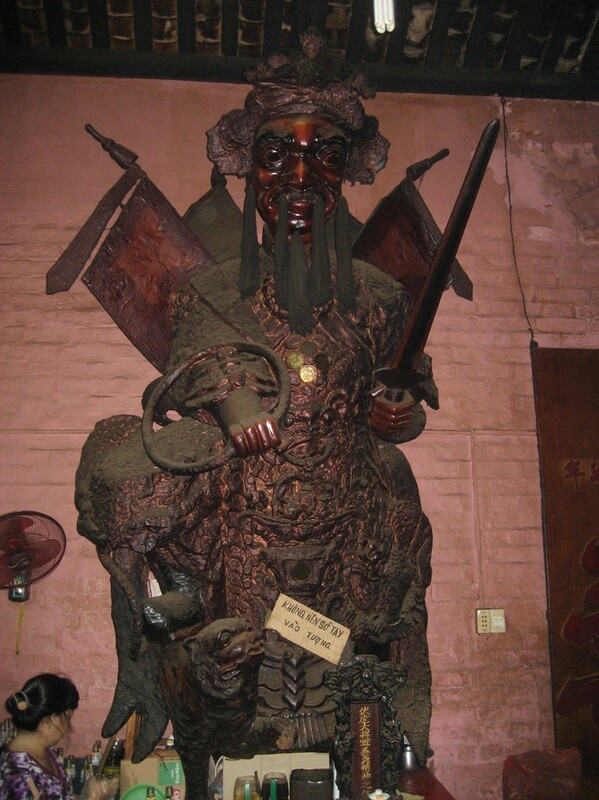 Then finally flew to Siem Reap in Cambodia before returning to the United States. We departed Chicago at noon on Friday, January 16, 2015 and arrived at Tan Son Nhut Airport in Saigon at 10:30 pm Saturday January 17. 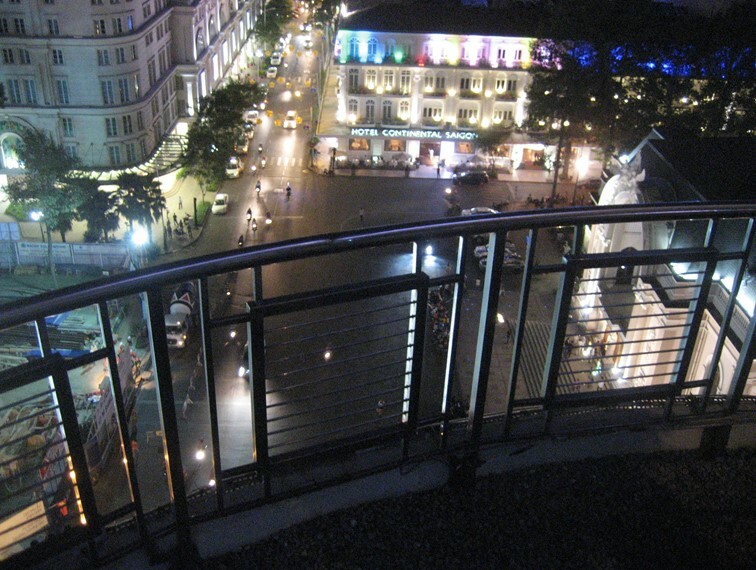 It took fourteen hours to Seoul, S. Korea and 5 ½ more to Saigon with a 3 hour airplane change in Seoul. 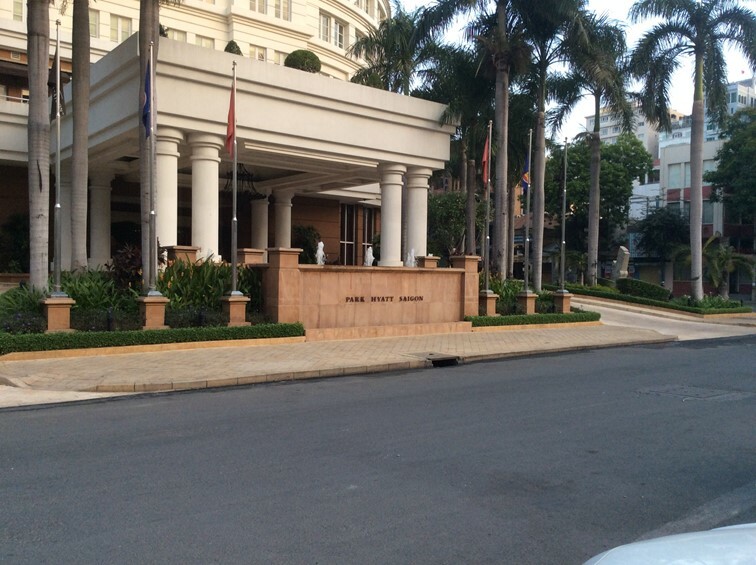 We stayed five nights at the beautiful Park Hyatt Saigon on the Eastern edge of downtown Saigon. 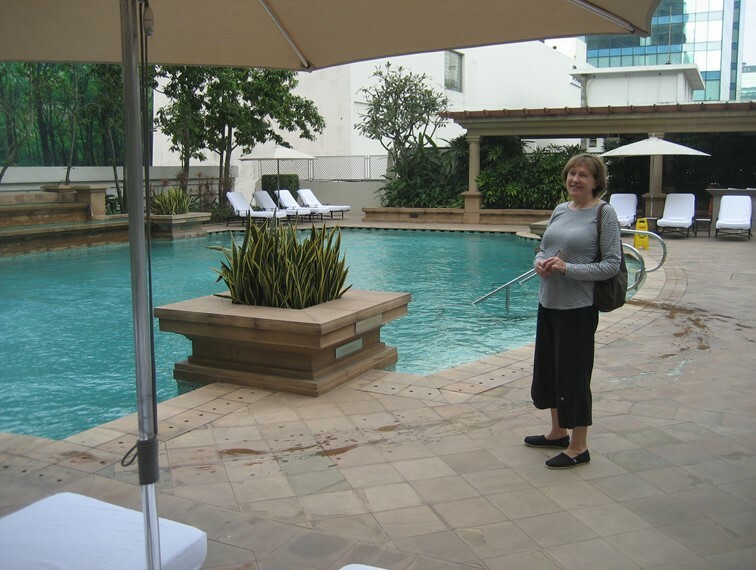 The hotel had a very nice pool which made Pat happy. 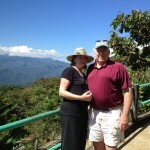 We enjoyed Sunday and Monday on our own before joining our tour Tuesday morning. 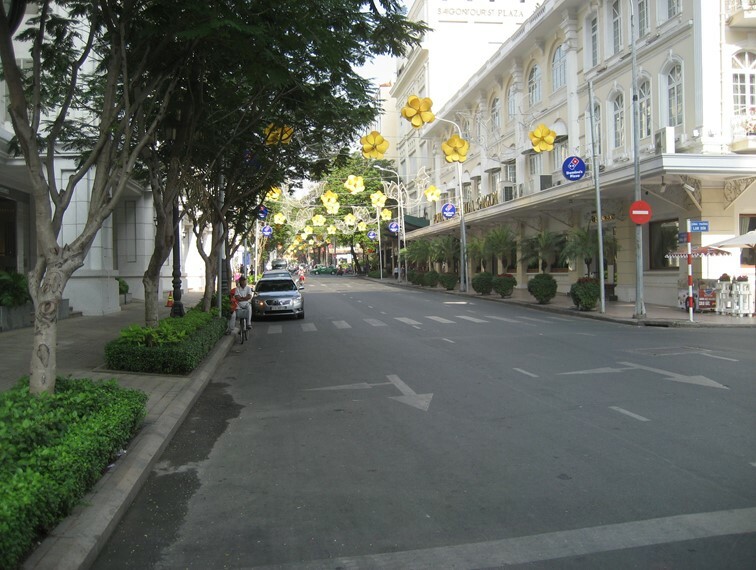 One must see the traffic in downtown Saigon to believe it. Bicycles have been replaced by motor scooters and motorcycles. Mixed in with cars and trucks, they go from curb to curb only inches apart, moving at 25 to 30 mph. Some hold produce on the way to market and some hold families of four, one standing on the floor board and three squeezed onto the seat made for two – most without helmets. Traffic lights are only a suggestion – no one stops. 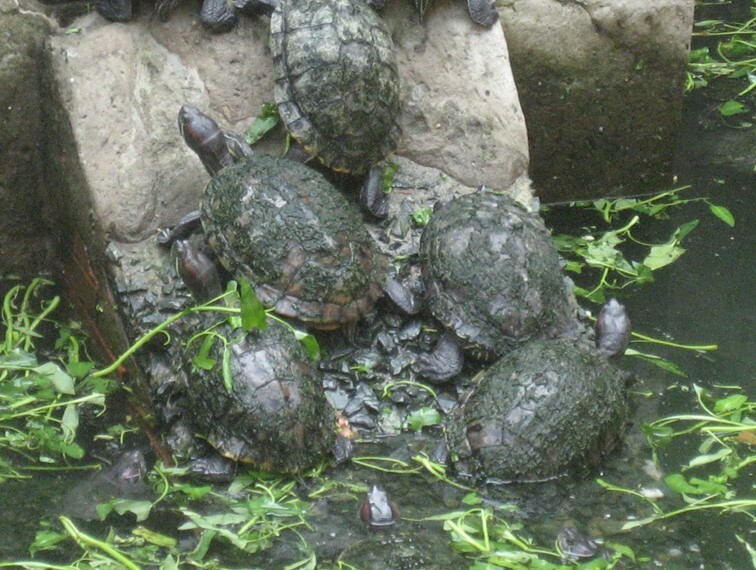 They merge. They turn left. They turn right. They run opposite the direction of traffic. They go up onto the sidewalks. And while all of this is going on, some are talking on their cell phones or sending text messages. To cross the street on foot, one just starts walking. Somehow, traffic gives way; even cars and trucks. Accidents are unbelievably rare. They all just seem to know the system. 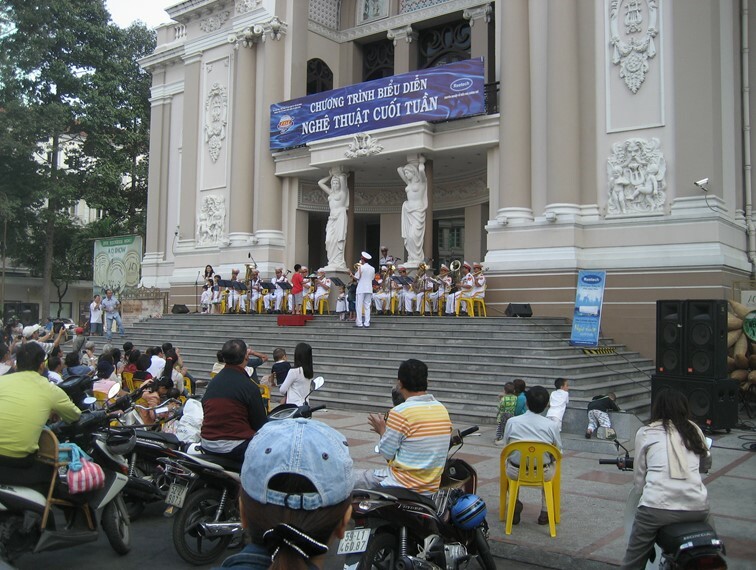 The city was gearing up for the Tet New Year celebration. Streets were decorated and bands were playing, all within a block of our hotel. We spent Sunday walking within reach of our hotel. 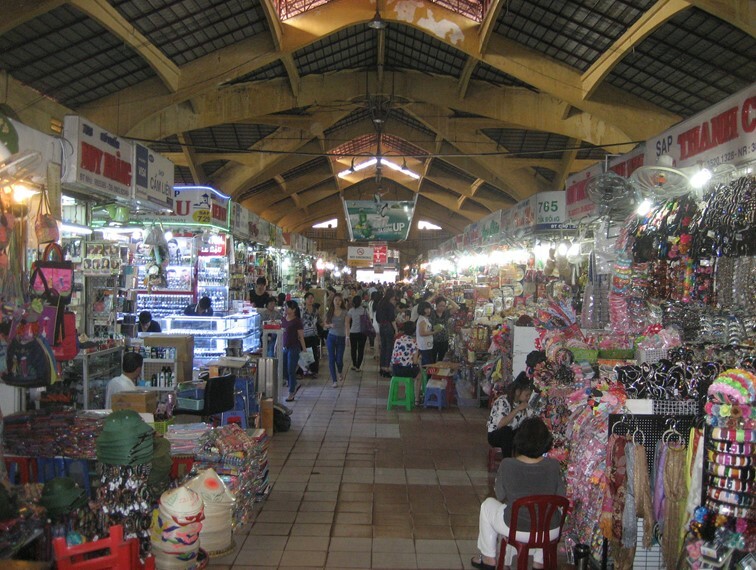 The first stop was the Ben Thanh Market. We just poked our heads in and kept moving. 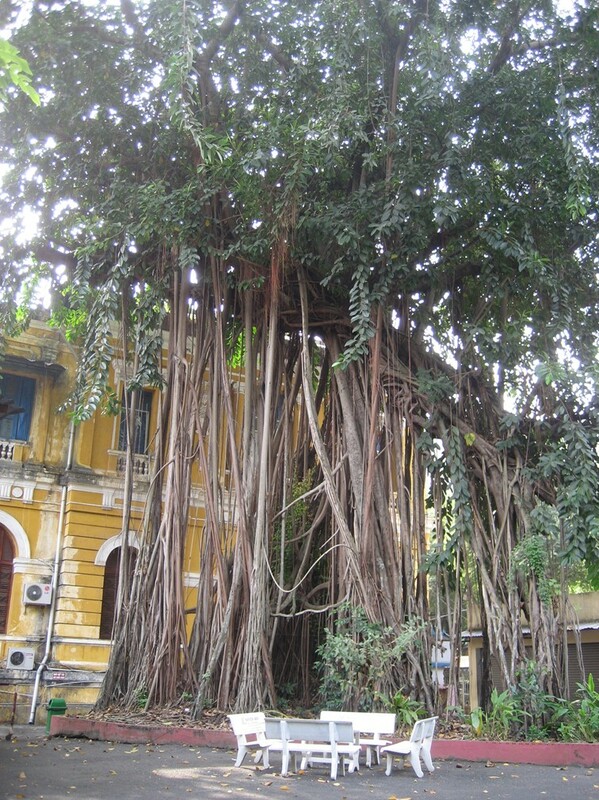 The roots from the Banyan Tree at the Reunification Palace below were just amazing. 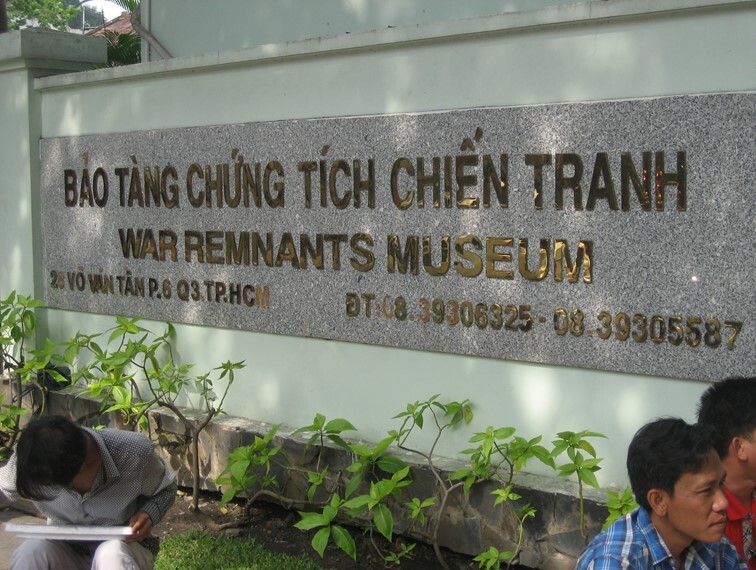 Our next stop was the War Remnants Museum. 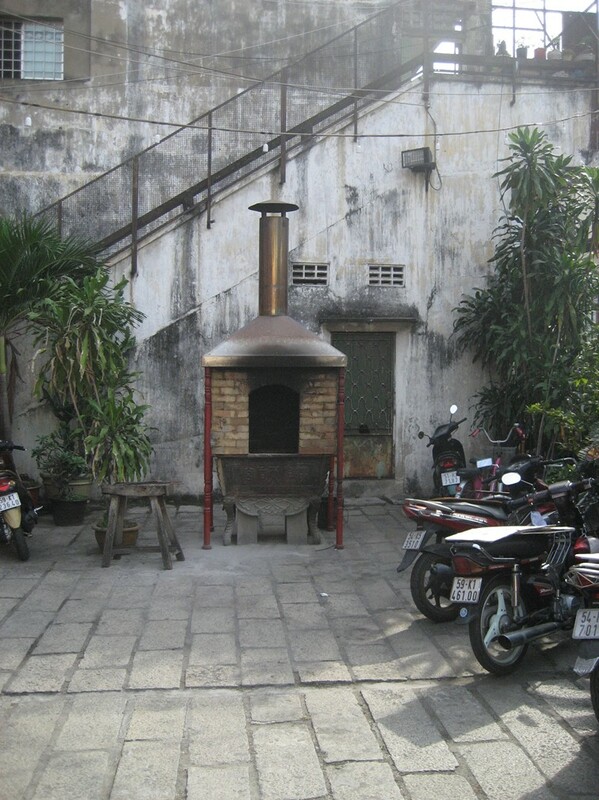 This was our first introduction to Vietnamese propaganda. 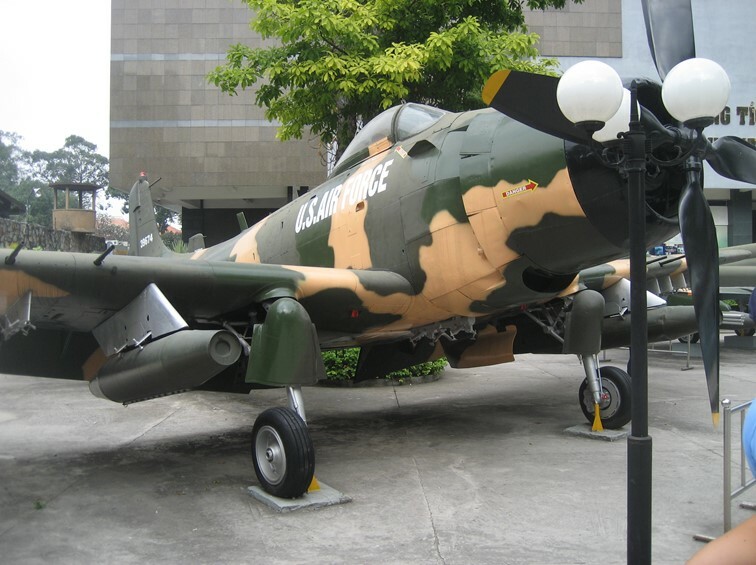 There were several U.S. warplanes on display that had been given to and used by the South Vietnamese. 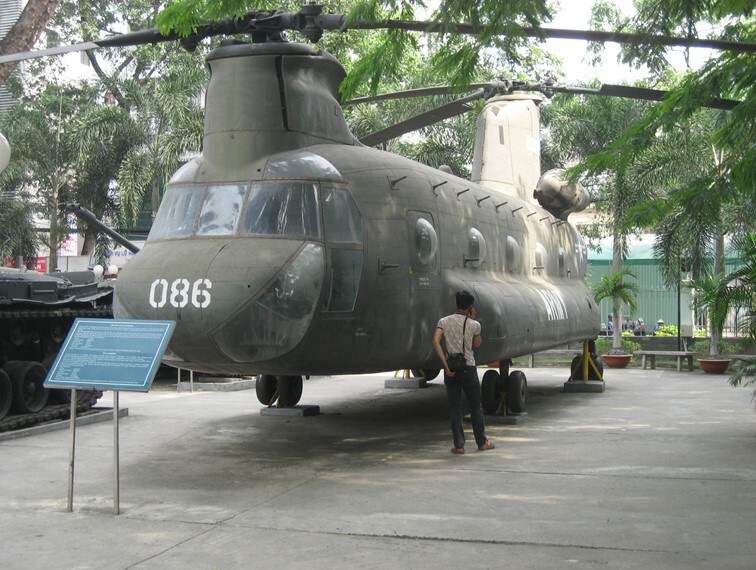 Below is a CH-47 Chinook helicopter. 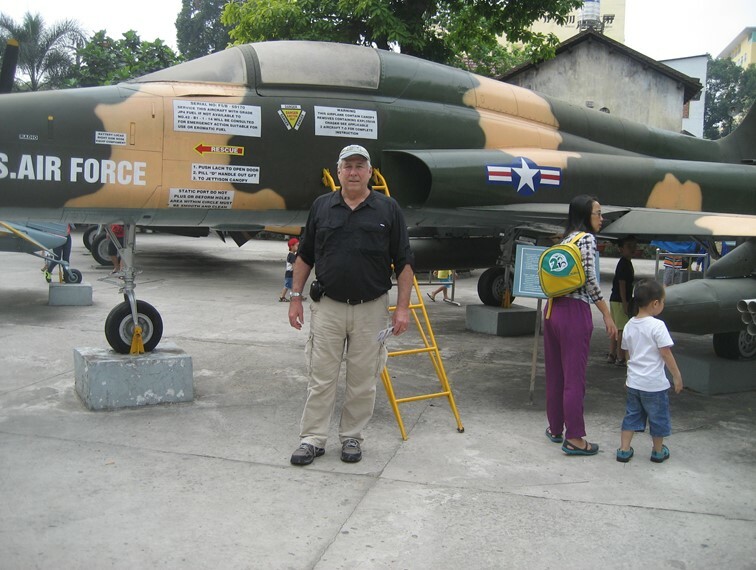 Below I am standing beside a supersonic F-5. This was a single-seat armored version of the T-38 that I flew for 6 months in U.S. Air Force pilot training. Below is the Huey helicopter. 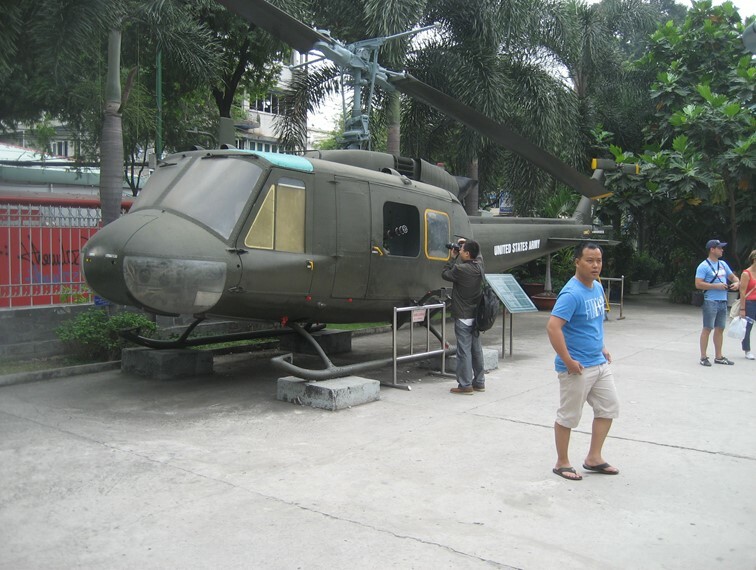 This was the workhorse of the Vietnam War and was used by both U.S. and South Vietnamese pilots. 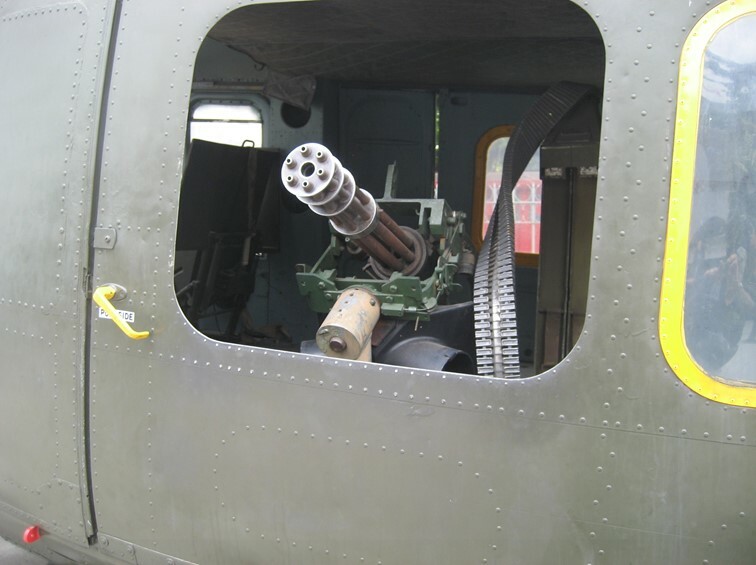 The A-1 Sky Raider below was primarily used as a Forward Air Controller and for Search and Rescue for downed pilots. Below is the A-37. 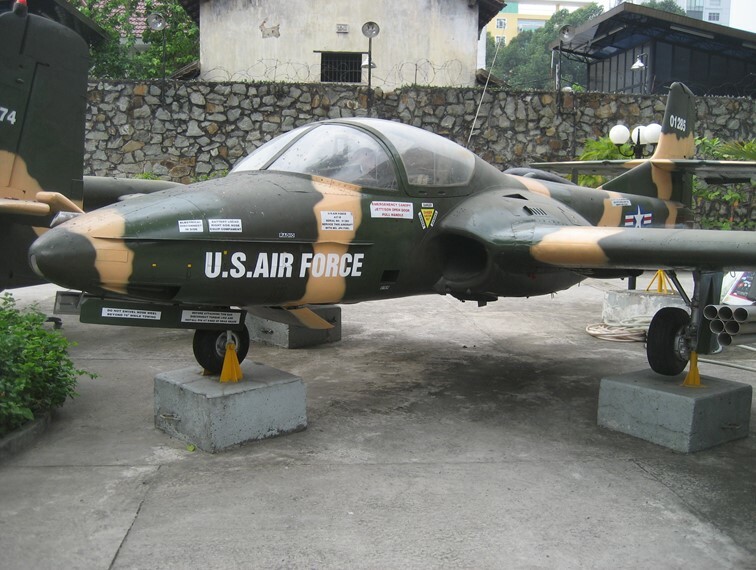 This was an armored version of the T-37 that I flew for 4 months in U.S. Air Force pilot training. 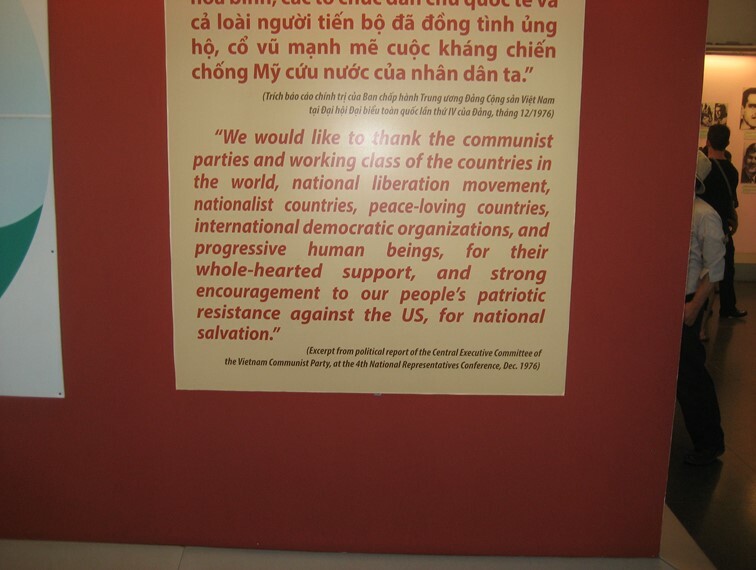 The plaque below is a ‘thank you’ to all of the communist countries that helped to defeat the United States. We continued our walk. 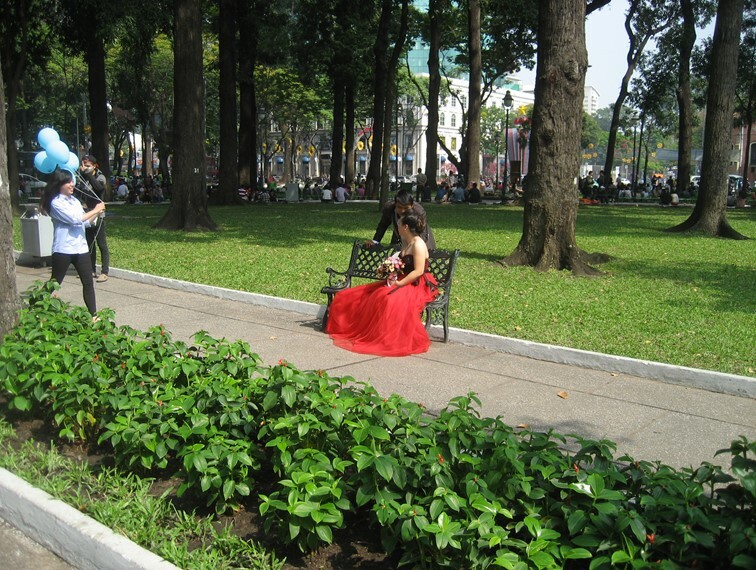 The central park area is beautifully suited for wedding pictures and almost every time we walked through the park there were some being photographed. Our walk back to the hotel took us past the Notre Dame Cathedral. 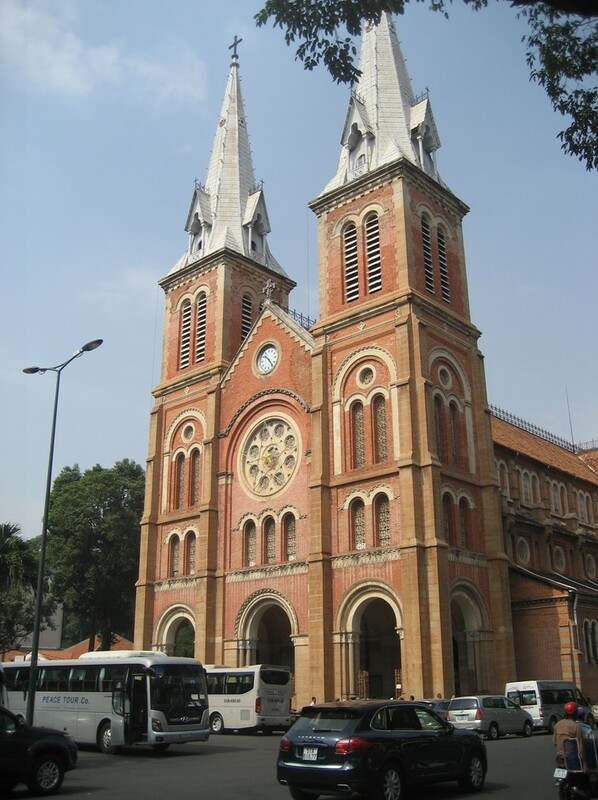 This was built in the late 19th century of locally quarried stone and covered with red ceramic tiles shipped in from France. 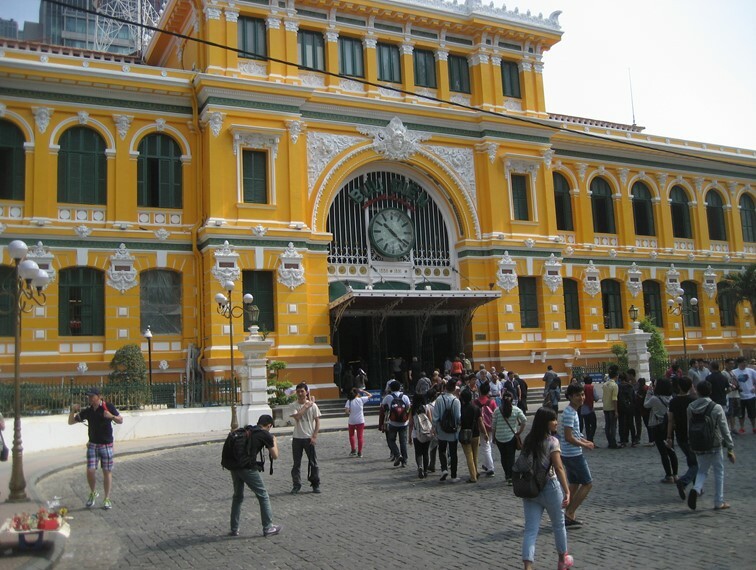 The General Post Office is one of the most handsome French-Colonial buildings in the city. And more wedding photos were being taken. Sunday night we enjoyed cocktails outside at the rooftop bar of the Caravel Hotel. 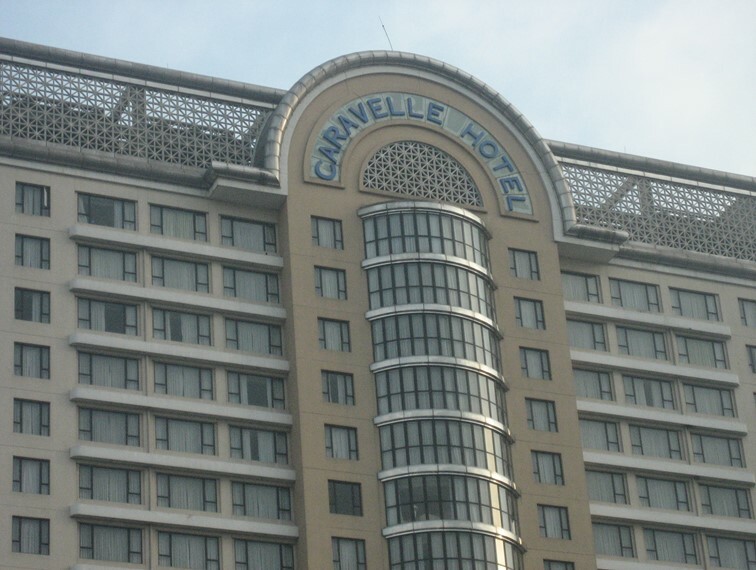 During the Vietnam War, this became the central headquarters for diplomats and journalists, who would joke that they could cover the entire war without leaving their seats at the rooftop bar. 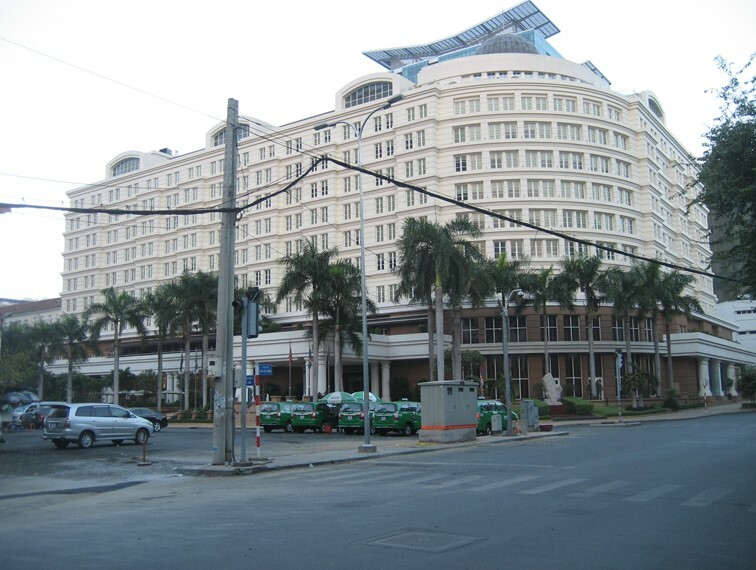 Following breakfast, we took a taxi to the Cholon District. 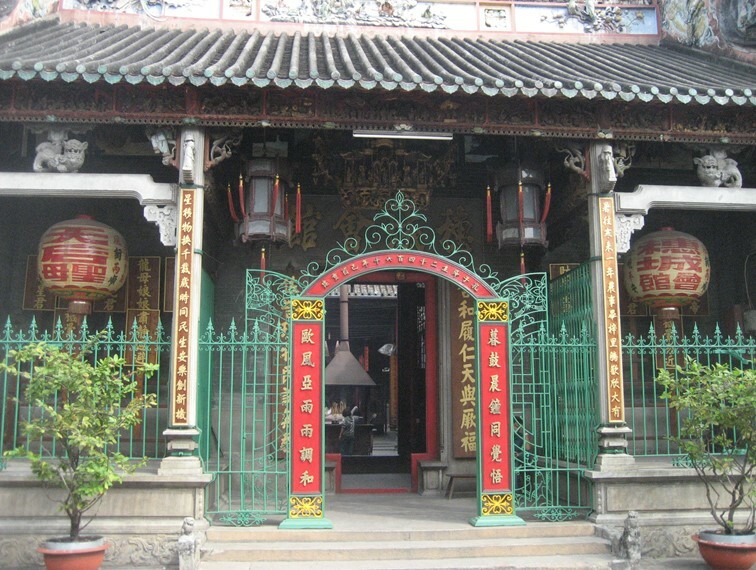 This area is home to Chinese traders and merchants for more than three centuries. 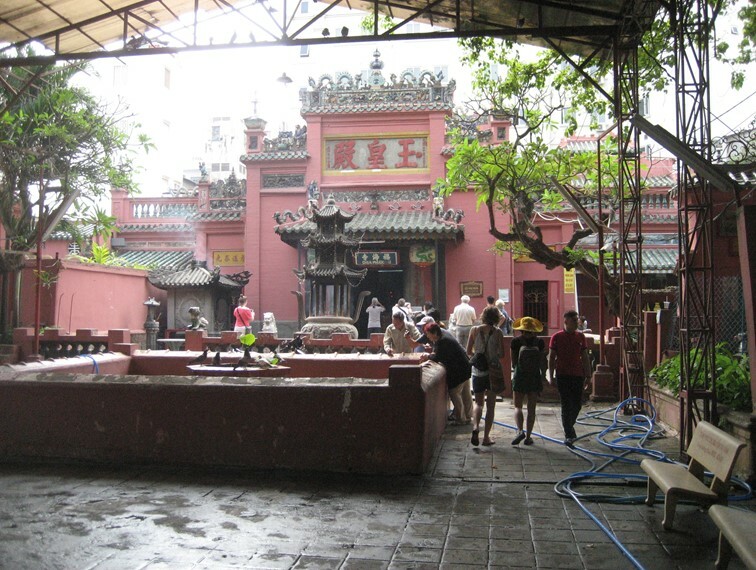 The area is a religious hub and home to several Chinese-style pagodas and temples. 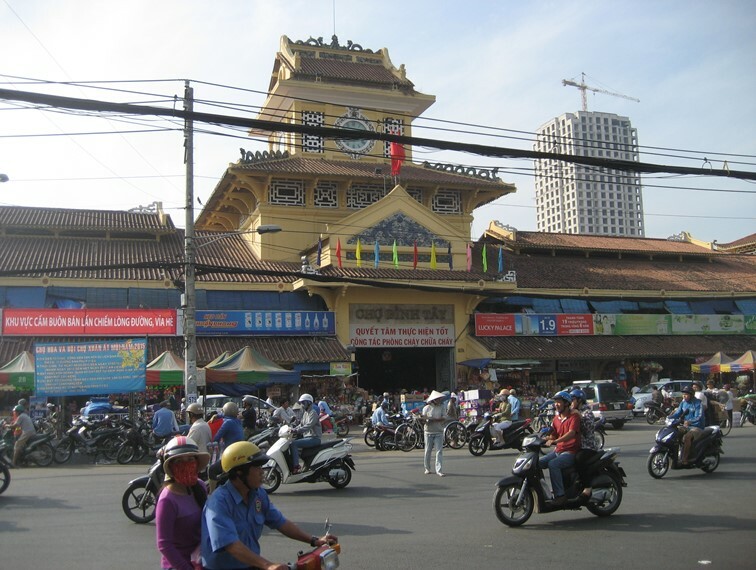 The driver dropped us in from of the main marketplace and we managed to orient ourselves on our map for a walking tour. 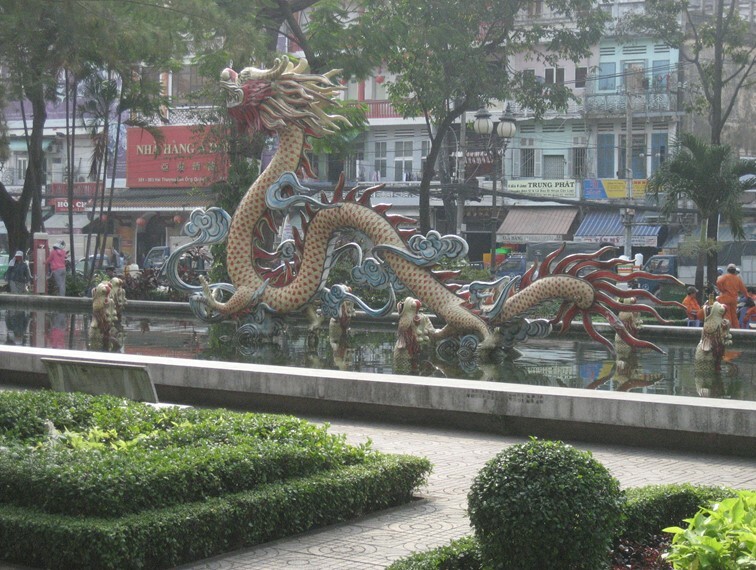 We walked past a public park with exercise equipment and a pond with this dragon statue. 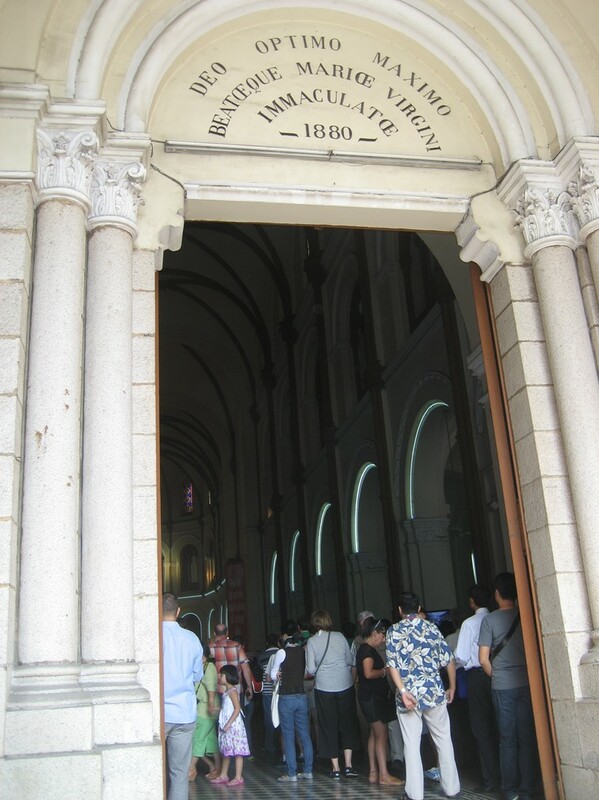 There was even a Christian church and school. We stopped in the courtyard and could hear the loud voices of children. 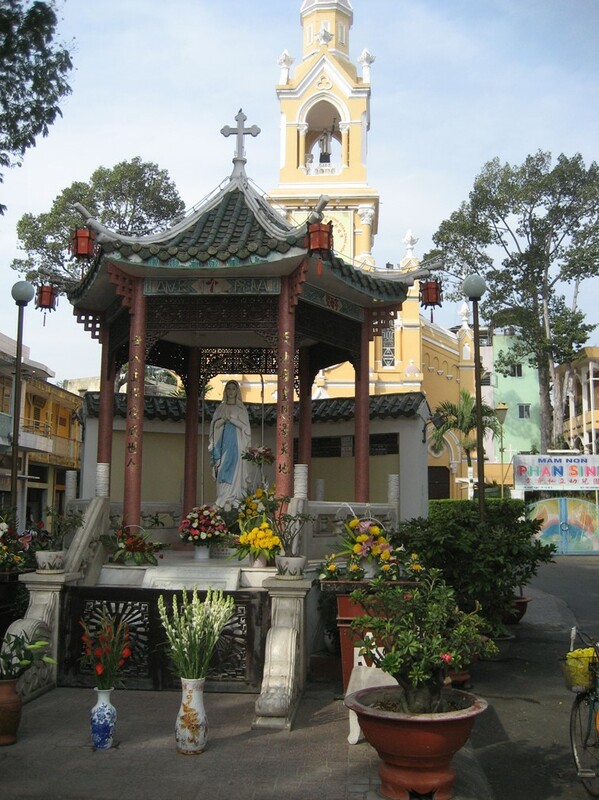 We continued our walk, stopping at several pagodas and came to the Thien Hau Pagoda, dedicated to the Goddess of the Sea and Patroness of Sailors. 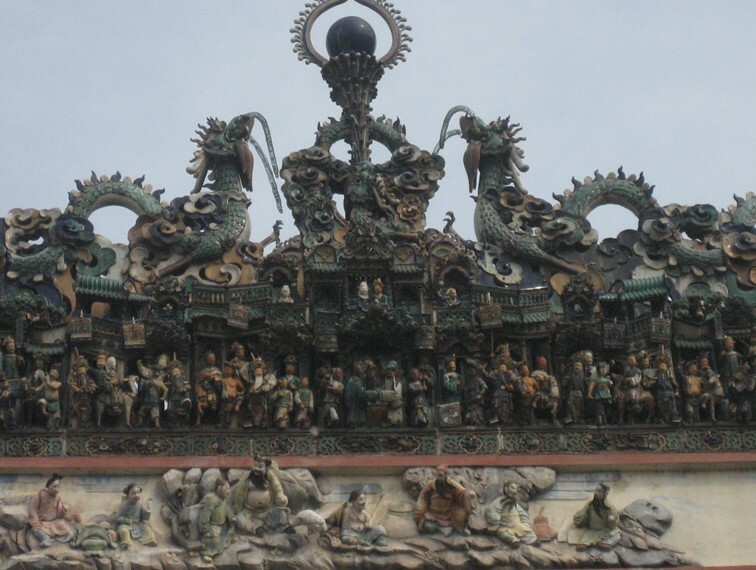 The roof was adorned with elaborately carved sculptures and ceramic friezes. Inside, there was a case of long brass objects. 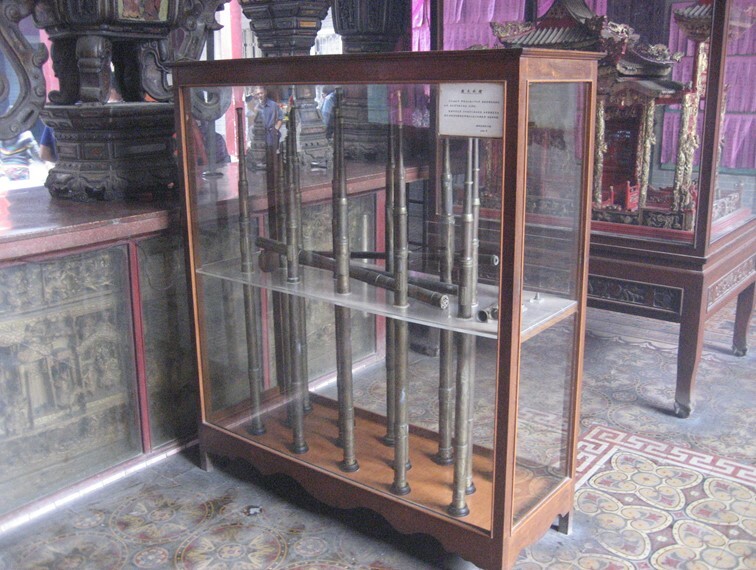 These are the nozzles of the fire hoses used to extinguish a fire that threatened the temple in 1898. 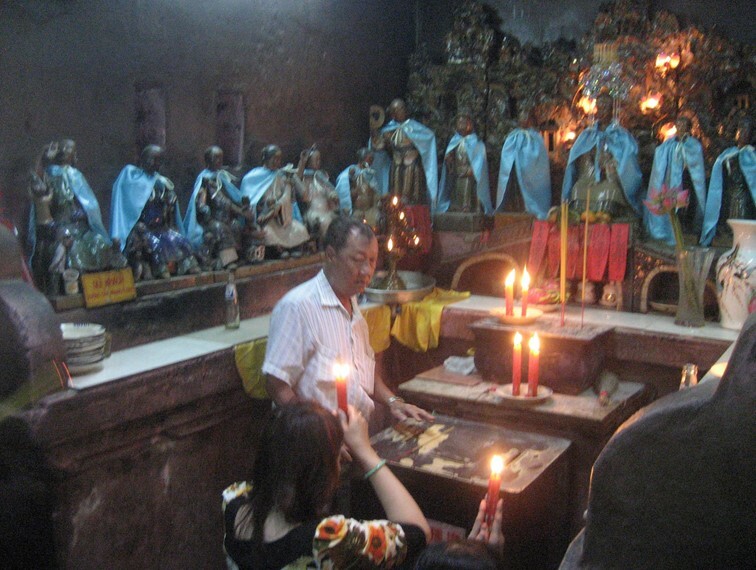 Incense is burning everywhere. 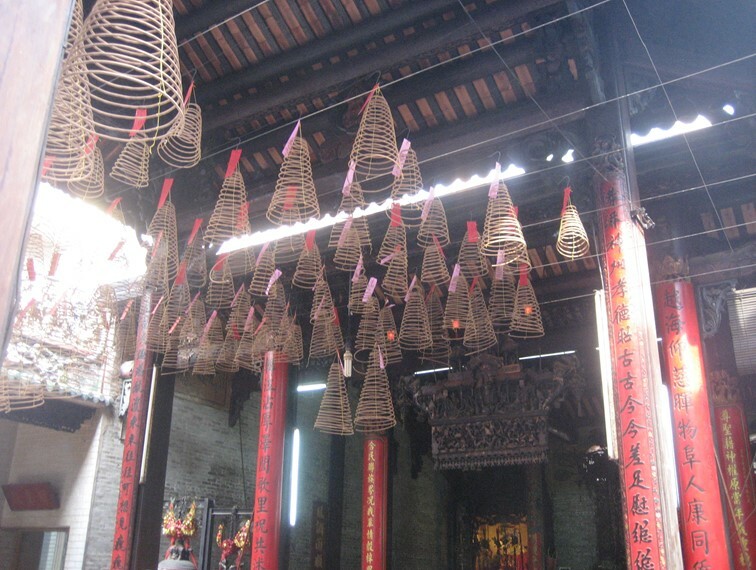 The coils hanging from the ceiling are, in fact, slowly burning incense. 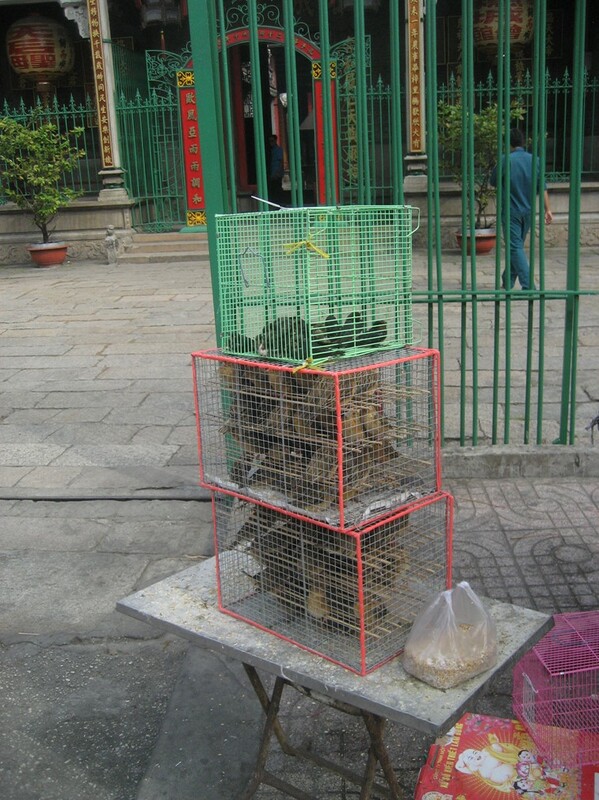 Outside were cages filled with birds which we assumed were destined for consumption. 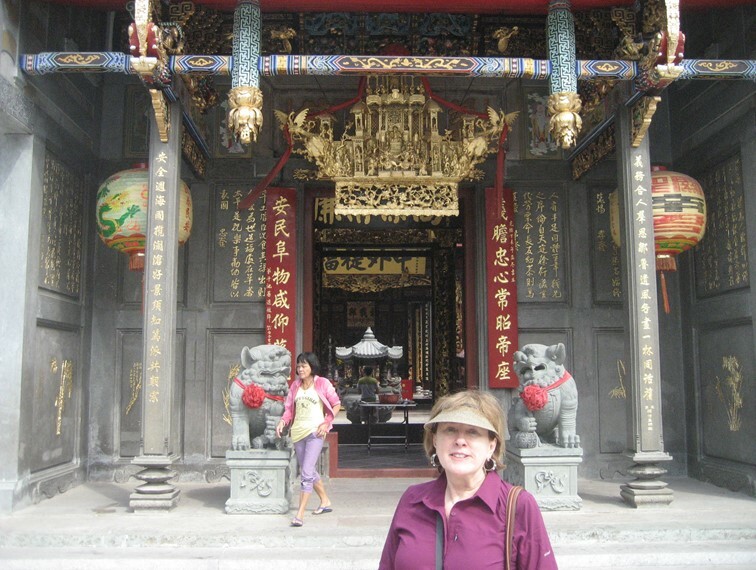 Below is Pat in front of the Nghia an Hoi Quan Pagoda. 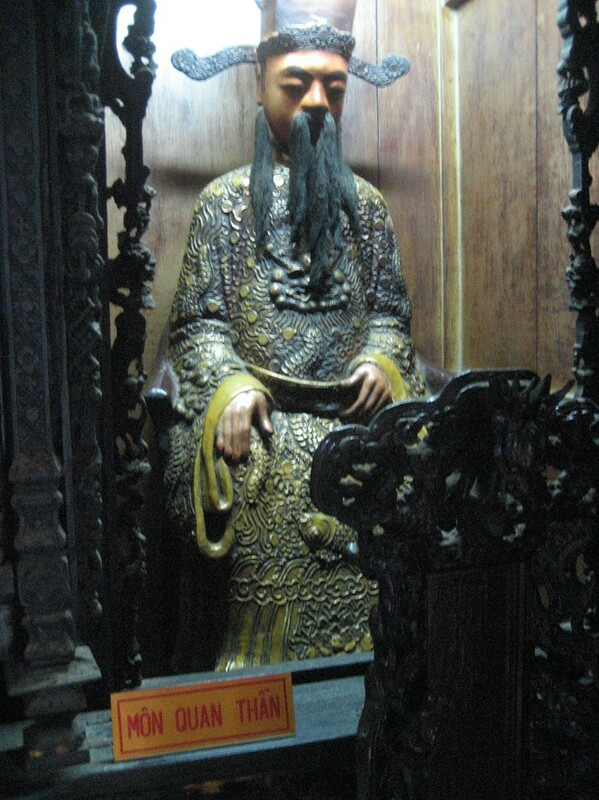 This was built in the 19th century and dedicated to Quan Cong, a deified Chinese general. 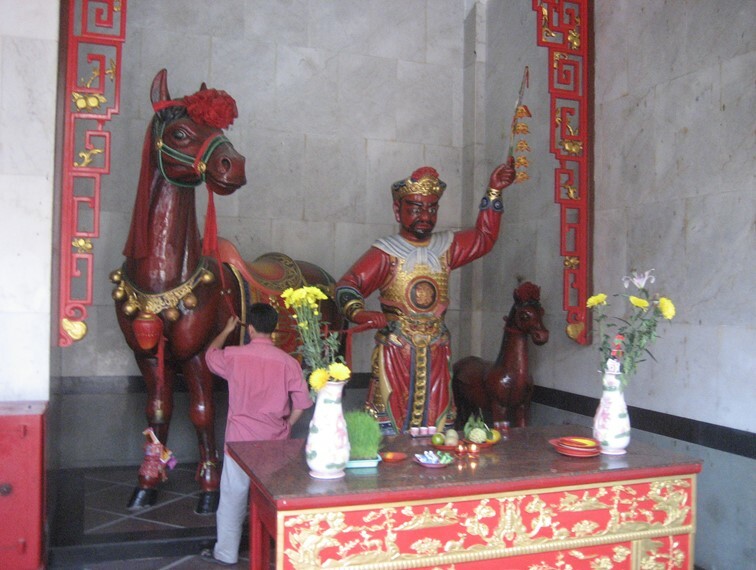 As you enter, there is a larger-than-life wooden statue of Quan Cong’s red horse. 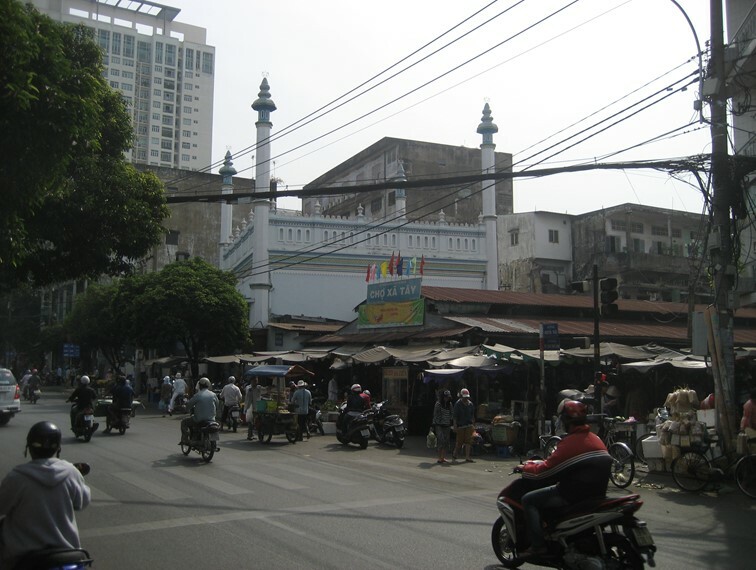 A little further along on our walk, we spotted the Cholon Mosque. 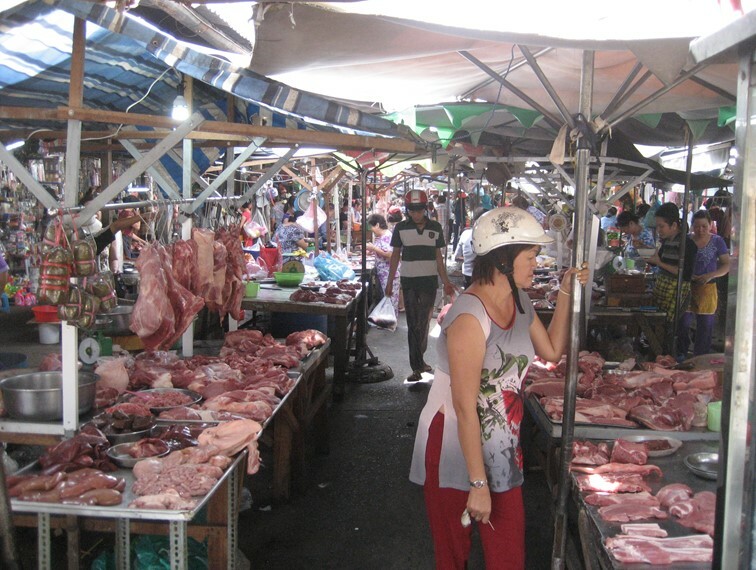 And right beside the Mosque was an open-air market selling meats of all sorts. At this point, we caught a taxi and returned to our hotel. 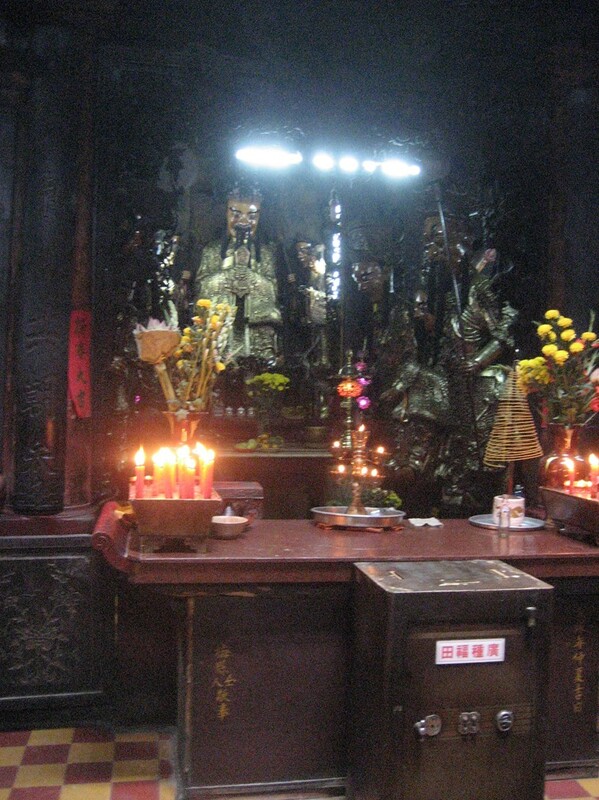 We then walked several blocks to the Jade emperor Pagoda. 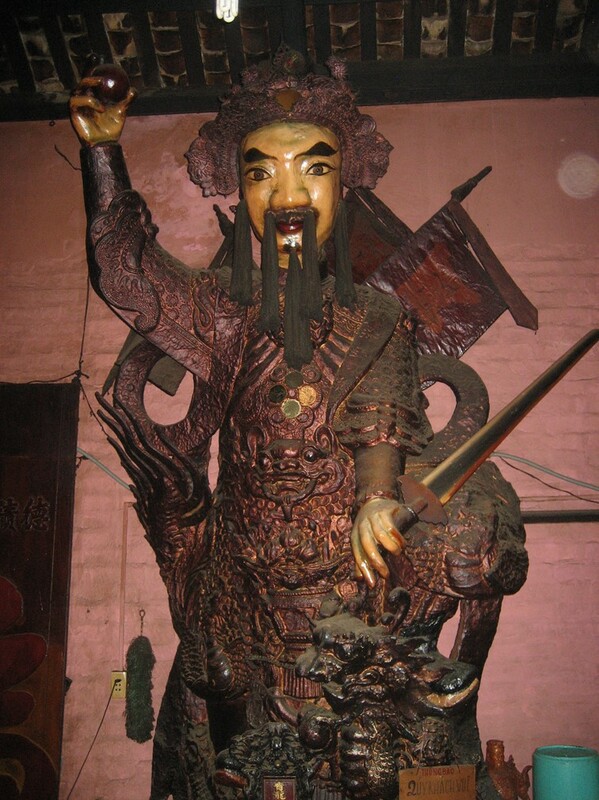 This honors the King of all Heavens, Ngoc Huang or the Jade Emperor. 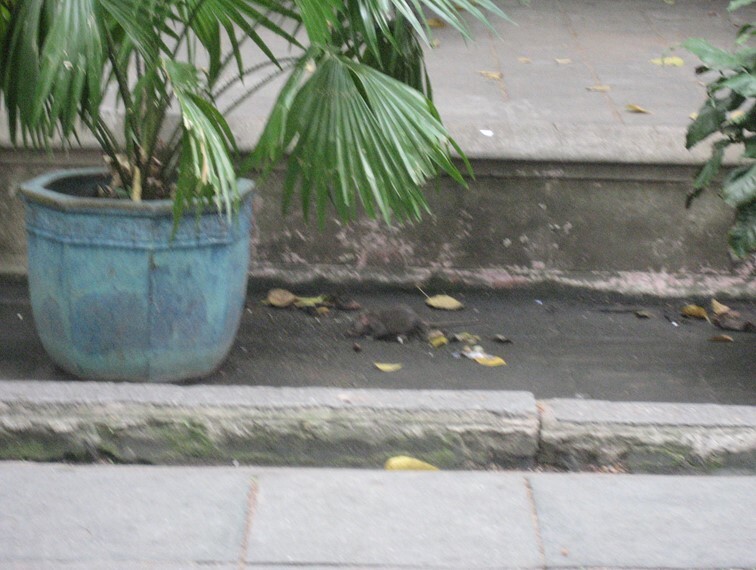 We rested on one of these benches for a few minutes and observed a rat moving in and out of a drainage pipe with apparently no regard for any human threat. 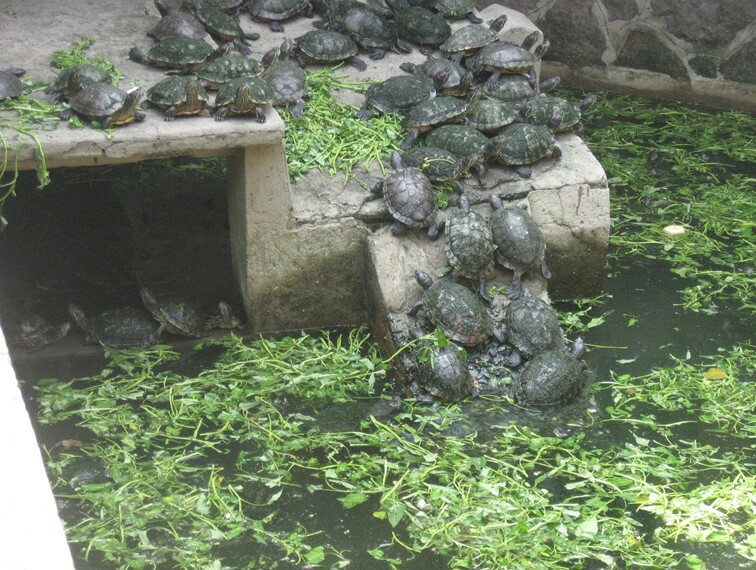 There was a turtle pond just to the right of the entrance to the main part of the Pagoda. 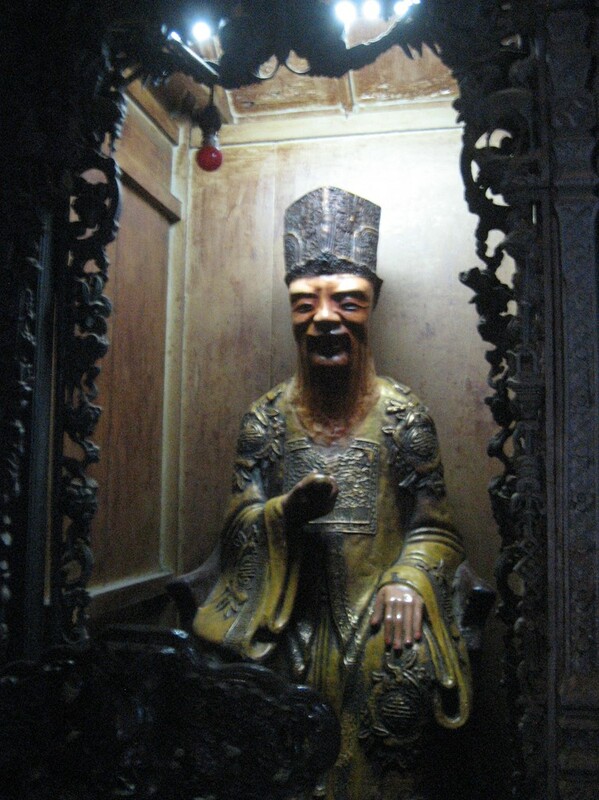 Inside there were many images of Buddhist and Taoist deities, all draped with blue robes. We made a brief stop at a McDonald’s we had spotted hoping for a chocolate milk shake. But, no luck, so we settled for ice cream, then caught a taxi back to our hotel. Later in the afternoon we got massages and I got a pedicure. We found a secluded restaurant near our hotel for dinner and got ready to start a new adventure in the morning with our tour group.